Barnaby Joyce, whose National Party rules alongside Prime Minister Malcolm Turnbull's Liberals, has been front-page news in Australia for two weeks since it emerged he had left his wife of 24 years for his younger former media adviser, who is now expecting their baby boy. 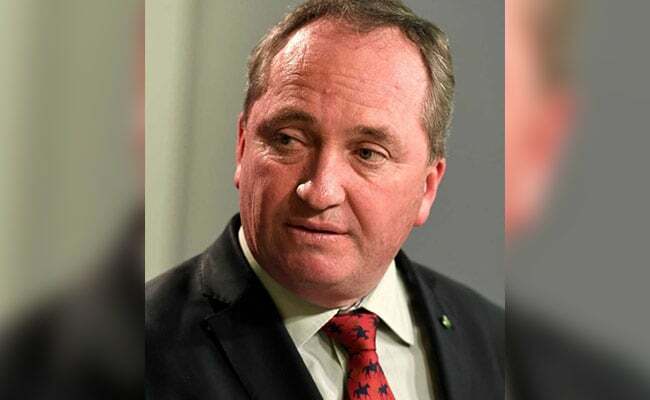 Sydney, Australia: Australia's scandal-hit deputy leader Barnaby Joyce announced Friday he was quitting and moving to the backbench amid claims of sexual harassment and controversy over an affair with a now-pregnant former aide. Joyce, whose National Party rules alongside Prime Minister Malcolm Turnbull's Liberals, has been front-page news in Australia for two weeks since it emerged he had left his wife of 24 years for his younger former media adviser, who is now expecting their baby boy. "It's incredibly important that there be a circuit-breaker, not just for the parliament, but more importantly, a circuit-breaker for Vikki (his lover), for my unborn child, my daughters and for Nat (his wife)," he said. "This has got to stop. It's not fair on them. It's just completely and utterly unwarranted, the sort of observation that's happened." Joyce, who has also been criticised for living in an apartment rent-free with now partner Vikki Campion after splitting with his wife, was due to be the acting prime minister this week with Turnbull meeting US President Donald Trump in Washington. With Foreign Minister Julie Bishop also out of the country, the role has been assumed by Senate leader Mathias Cormann, who said ahead of Joyce's decision that any harassment claim must be taken seriously. "Any allegation of sexual harassment is a very serious allegation," he told reporters. "I understand that a formal complaint has been made, and that that complaint is being investigated." Joyce called the claim "spurious and defamatory" and said he wanted it investigated by the authorities. "I have asked that that be referred to the police," he said, while admitting it had been "the straw that broke the camel's back". "It's quite evident that you can't go to the despatch box with issues like that surrounding you." But it has also highlighted the perilous state of the coalition government, which just a few months ago survived a crisis over lawmakers' dual citizenship that threatened its wafer-thin parliamentary majority. Last week a furious Turnbull, who relies on the smaller National Party to govern, savaged Joyce for "a shocking error of judgement", leading his deputy to fire back that the prime minister was "inept". In a statement from Washington, Turnbull Friday thanked Joyce for being "a fierce advocate for rural and regional Australia", while insisting the Nationals-Liberal coalition was "undiminished" by the scandal. But Labor opposition leader Bill Shorten called it "fundamentally damaged" and accused Turnbull of "an atrocious lack of judgement". "The fact that this scandal has dragged on for 16 days has been damaging to the government, but more importantly, the country," he said. Joyce's decision to quit came with colleagues reportedly growing increasingly frustrated with his handling of the love-child scandal. Joyce had opted to give several media interviews this week, at a time when he was expected to be on leave and out of the spotlight, prompting two of the party's backbenchers to publicly call on him to resign.